As a young teen living off a meager allowance and the money I made doing a paper round I spent a considerable portion of my earnings on CDs and blank cassette tapes. The latter was invaluable to me as I spent many hours bootlegging music. My preferred weapon of choice was the TDK D90 casette – 180 minutes of pure joy could be crammed on to one of these bad boys when set to long play. I filled more than a hundred with albums from my mates’ (and their parents) record collections. Adding the entire back catalogues of Van Halen, Iron Maiden, Bon Jovi and White Snake amongst others to my continually growing Hard Rock and Heavy Metal collection, thanks to my best mate Dominic’s dad. I hadn’t yet discovered the raw energy of Punk Rock or the alt. cool sounds of Grunge, Indie and Alternative music. I was reminded of my heavy metal bootlegging days, yesterday, when I came across Project C-90, the art of the cassette. 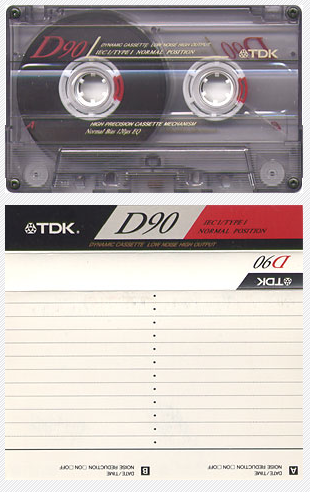 It is a highly comprehensive guide to the blank cassette tape – browsable by make and model. If, like me, you are holding on to a romantic memory or two of times spent listening to cassette tapes filled with your favourite records or artful mixes you made for long journeys by car with your parents, then check out the collection. You won’t be disappointed.